With next week's Mobile World Congress focused on mobility and CPUs that use less power than a phone charger, sometimes it's good to get a little red meat to cleanse your palette. Fortunately that's what Boxx is serving up with what it ostensibly claims is the "world's most advanced computer workstation." 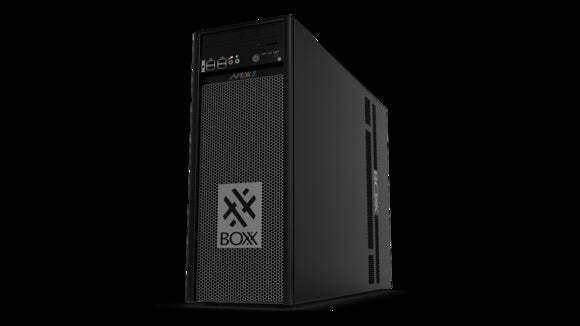 To put a stake on that claim, Boxx said its new Apexx 5 can pack in no less than 36-cores and five GPUs. And no, by 36-cores Boxx isn't counting Hyper-Threading virtual cores. If it did that, the Apexx 5 would be a 72-thread workstation. 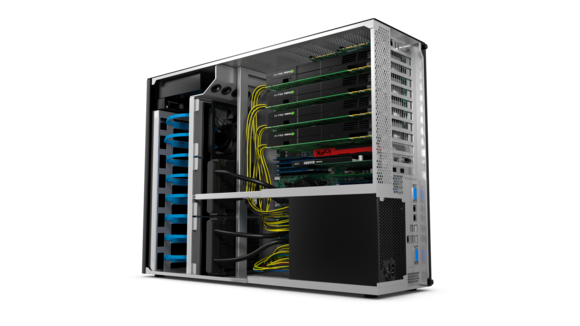 The company achieves its core count by using a pair of 18-core, liquid-cooled Xeon 2699V3 chips. Those are Haswell-based CPUs with clock speeds of 2.3GHz to 3.6GHz. The Apexx 5 can take four dual-width GPUs and a fifth single-slot GPU. How about 512GB of RAM? Maximum RAM in the Apexx 5 is actually 512GB of registered DDR4/2133, although the current configuration tool only lists 256GB. Boxx says it limited it to that amount, but the larger DIMMs can be selected by going through sales. 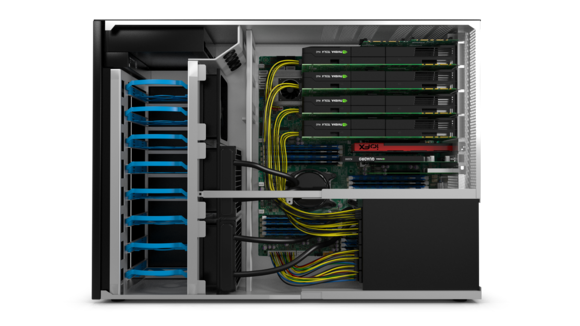 Workstations aren't just about the CPU, so the Boxx says the Apexx 5 can accommodate four dual-slot GPUs such as Nvidia's Quadro K6000 cards, Tesla or AMD FirePro W9100 cards. Boxx says you can install another single GPU to drive more panels and still add a PCIe SSD and 10Gb Ethernet card to the machine. The company said the fifth GPU would drive monitors, while the other GPUs are used to render projects. For bulk storage, the case can be outfitted with up to eight mechanical hard drives or split into 16 SSDs if need be. If you put your hands on the 10TB hard drives, that's a smooth 80TB of storage. The Apexx 5 runs off of a 1250 watt PSU. So what does the Apexx 5 cost? That all depends on what you stuff inside the chassis. The 18-core CPUs themselves aren't even carried on Intel's public price list, but I found them for $6,600 a piece. For kicks, I had Boxx spec out an Apexx 5 with a pair of Xeon E5 2699v3 chips, 512GB of DDR4/2133, three Quadro K6000 cards, a fourth Quadro K2200, two 480GB Intel 730 Extreme Performance SSDs in RAID 0, another four 800GB SSDs, Blu-Ray drive and a sound card (cause we have the slots, right?) and it came in at $58,349. Obviously, the price can be pushed up even higher. Why this matters: Despite the belief that the world of computing will be sucked up into the cloud while we dance around with tablets doing our work, that's not going to work for all of us. That doesn't mean we all need $60,000 workstations, but for those who do, it's well worth it.